ProRealTime Futures Trading enables trading on all Futures, Forex, options, shares, including US shares, using the best technology; ProRealTime Software and probably the best Futures broker, Interactive Brokers (the world's number 1 in Futures). What is ProRealTime Futures trading? Why did I move to ProRealTime Tradingto trade Futures? In a sentence: ProRealTime Futures Trading is the combination of ProRealTime charting software in the Complete or Premium version and the Futures Broker Interactive Brokers, the union of the ProRealTime charting platform in Complete or Premium version and the world's number 1 Futures Broker. I have traded with Interactive Brokers since September 2006, they are the benchmark broker for Futures because about 60% of the global Futures volume passes through them. Suffice to say that Hedge Funds notably use them. They are very thorough, order execution is remarkable for Futures and also for US shares, options, Forex etc. But Interactive Brokers suffers from a few weaknesses that ProRealTime Futures overcomes. I retained all the advantages of being with Interactive Brokers but I have other advantages that ProRealTime Trading gives me. Here are just a few reasons that made me switch from Interactive Brokers to ProRealTime Trading for Futures. Interactive Brokers requires a minimum deposit of €10,000 to open a Futures account but ProRealTime Trading only requires €5,000. Interactive Brokers' customer support is not its best point, it is quite often criticised. I remember trying to call, the other person did not speak my language (French) and he did not understand my very approximate English. Quite honestly I did not understand what he said to me... I finished by hanging up without having answers to my questions and cursing my dismal level of English. ProRealTime Trading has its own customer support based in Paris which is available in several languages including English, French, German, Spanish and Dutch. This way there is the certainty of having a competent contact who knows about both the ProRealTime Software and the Futures environment. ProRealTime Futures has high level contacts with Interactive Brokers' hierarchy. Direct IB customers do not have these contacts. This can be very useful in the event of possible problems. The big weakness of Interactive Brokers is its charting and order placing interface called the Trading Work Station (TWS). It from another time, intended for fund managers with a hundred lines of shares in swing trades. But it is not at all adapted to scalping or day trading. Using TWS felt like being in the 1980s, and it is even more complicated to manage when you are starting. When I was with Interactive Brokers, I had to get an additional interface for placing orders (DOM) for €99 a month (Button trader) and graphical software for €99 a month (Ninja Trader). The cost to be able to trade "normally" was almost €200 a month that is €2,400 per year. In fact, it was difficult if not impossible to scalp with the TWS interface that IB offered. It was suitable for swing trading and day trading, but not really for scalping. 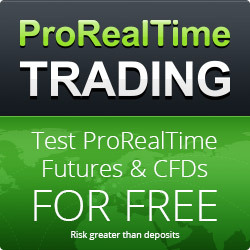 ProRealTime Futures Trading offers ProRealTime Software in either a Complete or Premium version for free by trading a little (a reduction of 1€ per contract), which reduces expenditure. They also provide the best trading conditions with a superior level charting interface. With Interactive Brokers all market data is charged whatever your trading volume. ProRealTime Futures offers a reduction to market data prices of €1 per contract you trade which means that by trading a little, you can get market data for free. Interactive Brokers' billed market data are a little dissapointing (low cost). In contrast, the Futures market data from ProRealTime Futures are tick by tick, essential for effective trading. With ProRealTime Futures Trading, commissions are negotiable after a certain volume. Of course, if you are trading 100 lots or 10,000 lots per month, the commission will not be the same. Mention that you are coming on behalf of Andlil and you will have an attentive ear. By going through ProRealTime Futures Trading, I have the best of both services in a single account. ProRealTime Premium version Software and free premium market data by trading a little which allows me to save over €200 per month. Customer support that speaks several languages and who know and understand the ProRealTime software perfectly. The brokerage service and order placement of Interactive Brokers, the world leader in Futures. Interesting article! Thanks for sharing. I use PRT with and IG CFD account for automatic trading. It works really well. PRT has a number of strengths, but also some weaknesses. I know that PRT is working on adding functionalitysuch as being able to access more than one timeframe in automatic trading. But my overall impression is an extremely strong package. I have had almost no technical issues at all, which is a sign of strength. I average more than 10 trades per day in fx, equity indices and bonds.